Do you guys love rainy season and the perfect weather where we can sit in our balcony, sipping a cup of hot coffee or tea? I am sure we all love it, but rarely anyone would like to get drenched in the rain. however, we cannot always sit inside our house or come out occasionally throughout the rainy season. Many of us have errands to run or gotta attend their work no matter what happens. One of the disadvantages of rainy season is the choice of clothes. No matter what outfits you choose to wear, they are going to get spoiled due to the water, puddles and mud. So we need to carry raincoats and umbrellas etc., but you can even make them exciting and fashionable at the same time. 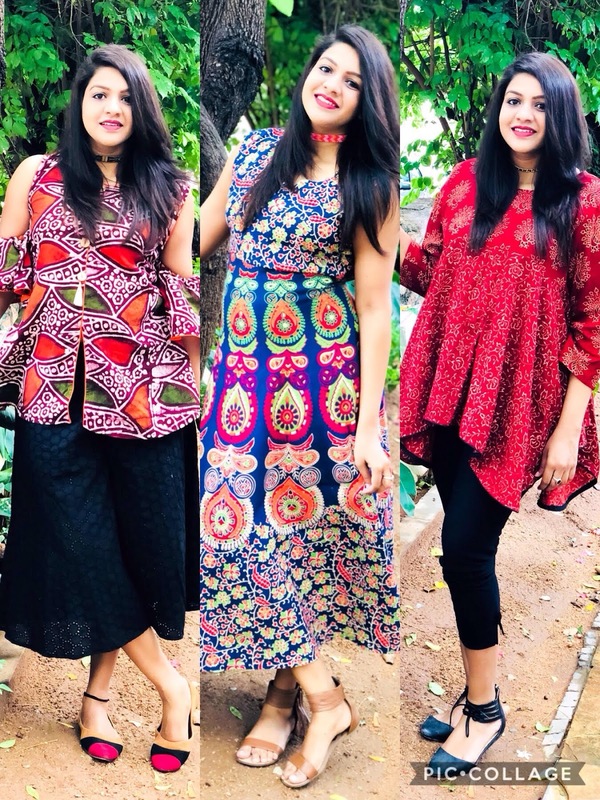 If you prefer a more traditional Indian outfits during this rainy season, then avoid salwars and patiyalas, but instead go for a pair of short kurtis with leggings. Long dupattas are difficult to manage so it can be replaced with scarfs or stoles. So, I came up with 3 easy Indian Rainy Day Outfit Ideas for this Monsoon season. Culottes are just perfect for this rainy season as they are comfortable and stylish for any body type. keeping the Indian Monsoon in mind these are just perfect to run errands around the city while it's drizzling. I paired these culottes from Max fashions India with a ruffled cold shoulder top which I purchased from an Expo in Ahmedabad, Gujarat. And for the footwear I chose to wear simple pumps from DSW. Cotton kalamkari dresses are the safest and the most reliable fabric for the Monsoons. It has some beautiful prints and bright colors but doesn't stick to your body or soak much water. It is the best time to flaunt your cotton dresses. I paired this free flowing cotton kalamkari printed dress again which I purchased from an Expo in Ahmedabad, Gujarat. For the footwear I paired these tassel ankle strap sandals again from DSW. Leggings and short kurtis are just indispensable especially when you are on the go. To make it a bit stylish opt for a cold shoulder kurti or a asymmetrical short kurti rather than a basic kurti. I paired these leggings from Zara with a cold shoulder asymmetrical short kurti which is again purchased in a Expo from Ahmedabad, Gujarat. For the footwear I chose to wear lace ankle flats from Charlotte Ruse. The clothes are so beautiful. I love the first blouse and the dress the most. This post is exactly what I needed. I'm headed to India next month and have been wondering what to pack since it will still be monsoon season. Super helpful and loved the outfits you put together! Oh, I really love the bright color and the outstanding print in these outfits. I like how these outfits stand out from the picture. I love all of these, but my favorite is the middle dress! I am loving all of the bright and beautiful colors for sure! loved the cotton clothes :) very prettily paired. OMG! YOU NAILED IT, GIRL! YOU LOOK ABSOLUTELY BEAUTIFUL IN THOSE DRESSES. I love the Cotton Kalamkari Printed Dress! It suits you so much! I'm definitely gonna try something like this. Wow, those outfits are amazingly beautiful and its really look good on you. I do love the Cotton Kalamkari Printed Dress it so beautiful and looks so comfortable to wear. These are great outfits. It is always difficult to choose what to wear in rainy weather, you are right that it is nearly impossible to keep your outfit clean. Such bright colours. SO so lovely! I went to India last year and decided that us Brits are so dull, we all wear black and dark colours. We need some more colour in our lives over here. These are lovely outfits! You look so good with all of it. I like how colorful and classy the outfits are! I love these outfits! So colorful and pretty!! I am loving all the bright, beautiful colors and patterns in these looks! They definitely brighten up a rainy day. I saw these on Facebook and loved them. I didn't see your shoes though. Those wrap arounds are so cute! Those outfit ideas look amazing! Love the colors and design especially the last one. You look gorgeous in those beautiful prints! Love the cotton kalamkari dress. These looks are all so colorful and bold. I especially like the top in the third outfit! I think the last outfit is my favorite. Its a gorgeous chic design! Love your outfits! They are so colorful and pretty! Love the last one the best!